Welcome to WomensHealthMatters.ca, a Canadian source for trusted, evidence-based and timely information on women's health. Our websites draw on the expertise of Women's College Hospital's multidisciplinary healthcare community to provide authoritative women's health information. Information provided on this site is created by health experts at Women's College Hospital and is designed to support, not replace, the relationship with your healthcare provider. Feature Articles on health topics and issues that affect the health of Canadian women. Health Centres to learn more about topics such as heart health, diabetes, mental health and osteoporosis. A Question of Health, Women's College Hospital experts answer a question about a health issue that's in the news or on women's minds. The WomensHealthMatters.ca and MyHealthMatters.ca websites are provided by Women's College Hospital as trusted sources of information, news and research findings on women's health. Our goal is to provide Canada's most reliable resources for online health information for women. We strive to provide a women-centred, interactive, non-judgmental environment for online health learning to enable women to make informed decisions with their healthcare providers. We embrace a broad definition of women's health that recognizes the importance of emotional, spiritual and physical well-being, as well as the influence of factors such as lifestyle, socioeconomic status and cultural background on women's health. For information about becoming a sponsor please contact us at digicomm@wchospital.ca. 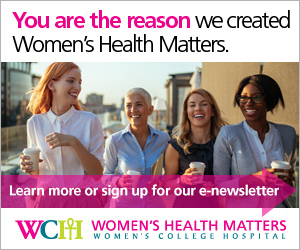 Our corporate sponsors do not exert any influence on the editorial content, selection of content or presentation of material on WomensHealthMatters.ca or MyHealthMatters.ca. Please note that we do not permit advertising on WomensHealthMatters.ca or MyHealthMatters.ca. The editorial team consists of health writers, editors, librarians and expert reviewers from Women's College Hospital, Women's College Research Institute (WCRI) and other leading healthcare organizations. Except where otherwise noted, all material has been produced by our editorial team and reviewed by healthcare professionals. If you have any comments or suggestions, please contact us at digicomm@wchospital.ca. The following policy outlines the requirements for linking to WomensHealthMatters.ca and MyHealthMatters.ca. It also outlines the criteria for providing external links to other websites. Any text-only link be clearly marked eg. "Women's Health Matters". Logos and word marks may not be used as a hypertext link without express prior written permission from Women's College Hospital. The link must open a page within the website. The page must be viewed in a browser window on its own and not be framed by the host website. The appearance, position and other aspects of either the link or the host website may not be such as to damage or dilute the goodwill associated with the Women's College Hospital name and trademarks. Women's College Hospital reserves the right to change this policy at any time. Women's College Hospital is not responsible for the information or materials contained on the host website. Links are provided for convenience of reference only and are not intended as an endorsement by Women's College Hospital of the organization or individual operating the host website or its content. Women's College Hospital is not responsible for the contents of any linked website or any link contained in a linked website or any changes or updates to such websites. The inclusion of any link does not imply that we endorse that website or the information and services provided by that website. We cannot guarantee the privacy or security of information you provide to the linked sites. These criteria may change at any time without notice to reflect the policies of Women's College Hospital. Sites that are link to are reviewed annually or as needed. If you find a page that doesn't link properly, please email digicomm@wchospital.ca. Send us with your comments and suggestions. We want to hear about ways to improve the website or what health information is important to you. Please note that questions about individual health issues or concerns cannot be answered. Please contact your healthcare professional.